The 2016 budget’s out – read six pages in the Analytic Perspective to get smart on what’s important in Fed IT. If you won’t do the homework, this cup’s a must-read. We did the reading so you don’t have to. In addition to the typical yada, yada on promoting innovation, encouraging small business, and chest thumping on questionable savings, there’s some critical data in the budget. Top line, more tech spending – up 2.7 percent to $86.4 billion. That said, there’s a slowing in growth. From 2001 to 2009, we had a 7.1 percent annual growth, which cooled to 1.7 percent. The administration claims partial credit for slowing growth – citing efficiencies achieved through better management. See See key charts for budget breakdown and trajectory. Seems the President’s given up on the 25 point plan – hooray! We’re down to three things. Driving value in IT investments, delivering world-class digital services, and protecting Federal assets. We’re seeing the Feds get into the state space – delivering more services directly to America. The White House’s doubling down on PortfolioStat – and getting clean and sober on open government. Despite a series of misfires on the IT Dashboard and transparency, the administration commits to making the results of agency PortfolioStats and IT savings performance available on the IT Dashboard. Let’s hope that OMB lives up to this commitment. 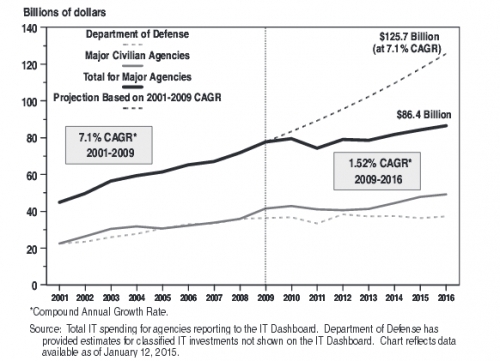 Bottomline – the White House says we’ve saved $2.7 Billion since 2012, through better IT management. Agile trumps waterfall – Administration claims 40 percent improvement in ability to deliver IT projects on time and on budget. Apparently cloud is happening. Budget tells us that 8.5 percent of the 2015 spend went to cloud “and other provisioned services” – that certainly doesn’t jive with GAO numbers. No disrespect to NSF, which has embraced the cloud – but it’s success is hardly a serious reference point for a major shift to the cloud across government. Big shout-out for data center closures – feds have shuttered 1,136 by August 2014. That said, it’s difficult to believe anybody’s really dead unless we can see the corpse. Not to be a skeptic, but we’d all like to see more details behind these assertions – please post that math on the IT Dashboard. How about some energy metering data – as well as hard expense costs by civilian agencies for data center operations. After all, Halvorsen committed to posting DISA MilCloud pricing – will Scott do the same in civies? It’s time to address the credibility gap. CDM appears more than any other acronym in the 2016 IT budget. That speaks volumes. The $14 billion allocation for cyber security and flagging of CDM will raise some eyebrows. The 17 CDM prime contractors are starting to ask questions about the program’s direction moving forward. DHS , any thoughts on how to accelerate the pace of the program rollout? So, that’s the new Fed IT budget flyby. Here’s the full text. Here’s the ADHD version. Spending up. Simplified – three priorities. Show me the money – promise of new transparency.